I’ve just watched an excellent 1943 documentary by Oscar Award-winning director Frank Capra, and produced by the US government. It’s a rare thing to behold: an accurate – in fact, a rather glowing – portrayal of Russia and its historical role as shock absorber to invading hordes. The film was recently uploaded to the YouTube channel of the US National Archives but, as far as I can make out, has been publicly available since 2011. 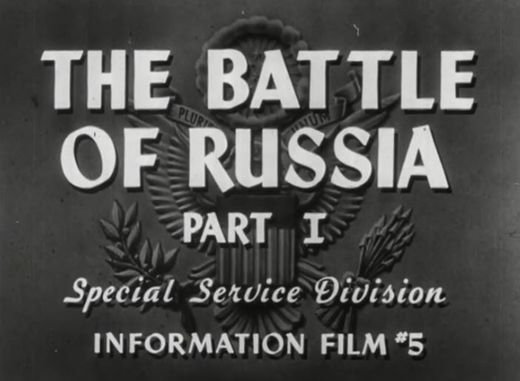 While the bulk of the film uses contemporary footage collected by US Army Intelligence during the war to capture the horror, scale and intensity of the Nazi invasion of Russia, and how the Russians ultimately defeated the Nazis through brilliant strategy and sheer force of will, the first part also goes into some historical context about previous invasions of Russia, as well as important geographical detail about the nature of ‘Russia’. I can’t vouch for the film’s complete historical accuracy. It is, after all, Pentagon propaganda! At one point, for example, the narrator mentions in passing that Russia was victim to Kaiser Wilhelm’s ‘tyrannical warmongering’ in the early 20th century. I can tell you, with some certainty, having recently read Hidden History: The Secret Origins of the First World War, that Germany was not at fault for WW1 (in fact, it tried to prevent it). Nevertheless, Hitler’s Operation Barbarossa in 1941 does fit a pattern of Russia historically being on the receiving end of aggressive invasions. For just a brief sliver in time, it was apparently in the US government’s interests to accurately represent the ‘most epic battlefront in known history’. Not only that, it also suited US interests to accurately represent Russia as a large ‘community of nations’. And that, essentially, is what defines her (both Imperial Russia and the USSR); Russia is a patchwork ‘country of many countries’, a vast territory comprising many ethnicities and nationalities. The incredible thing is that not two years after this film was made, Russia became the new ‘enemy of freedom’. In fact, we now know that the Atom Bomb was dropped on Japan in 1945 specifically to ‘send Russia a message‘. The international financiers pulling the strings behind Hitler and the Western Allies could not allow a parallel ‘United Nations’ to exist on the vast Eurasian landmass while they set about creating one centered on New York City. And thus began the policy of maligning, containing, and isolating Russia behind an ‘iron curtain’, until eventually peoples all along its periphery said ‘enough!’ and made a break for freedom and independent nationhood when the USSR fell… only to fall into the debt-trap set for them by the international banking elite. Recently, of course, ‘Russia the nation-state’ has itself emerged from the collapse of the USSR (and the subsequent ‘economic shock therapy’ applied by Wall Street) and regained a sense of its historical mission: to facilitate the inevitable integration of Eurasia and all its peoples, minus Western hegemony. 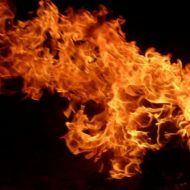 Have you seen the 20 part documentary, The Unknown War? 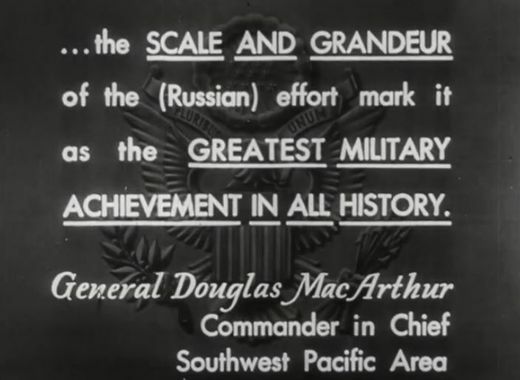 20 hours of footage supplied by the Soviets to a documentarian, and narrated by Burt Lancaster. Great collection! The greatest battles of World War II, the most colossal encounters of military force, the most devastating human losses which the modern world has ever seen, occurred on Russian soil during 1941-1945, on a battlefield that is unknown to most Americans. The conflict between Hitler’s Germany and Stalin’s Russia claimed more than 30 million lives. On the early morning of June 22, 1941, the Nazi Wehrmacht had amassed 4.2 million crack troops along a front that stretched for 1,800 miles, and Operation Barbarossa, the invasion of the Soviet Union began. The Nazi high command was extremely confident, expecting the total collapse of Stalin’s Russia within six weeks. In reality, The Unknown War raged on for nearly four years. Before it finished, the Nazis and Soviets fought the single greatest campaign in military history. The Unknown War covers that period of history beginning in June 1941, when Germany launched its surprise attack on Russia, through to the end of the war. The Unknown War was a landmark television series, detailing the drama of the Eastern European front during World War II. Academy Award Winner Burt Lancaster hosts the 20 part series. Film footage from Soviet archives comprises a major portion of the series, supplemented by film from both the United States and British archives. Burt Lancaster spent three weeks in eight cities in Russia, for location filming. The Unknown War was made as a counter to the deliberate distortions in the Anglo-American series The World At War, which chose to give as much coverage to the US in Italy as it did to the Red Army at war from the Arctic to the Black Sea. So blatant was the politically motivated distortion in The World At War that the Soviet authorities ultimately refused to cooperate in its production. Instead they set out to make a documentary series of their own that would tell the real story of the War in the East. The Eastern (Russian) Front of WW2 has been side-lined in the Western media for decades, reduced to just “one aspect” of the War, if it is even mentioned at all. Certainly there is never any recognition given to the fact that it was the main, decisive arena of WW2, the scene of a titanic struggle that, at the cost of 30 million Soviet lives, saved the world from fascism. No, I haven’t seen it. It’s definitely going on my to-watch list. Many thanks!